Classy baptismal candle for boy in white, black, gray. Very intense contrasts over the fabrics surrounding the candle forming big bows. On them are tied eyebands and beads with two-tone cords. The whole set has the monogram of the baby's name. 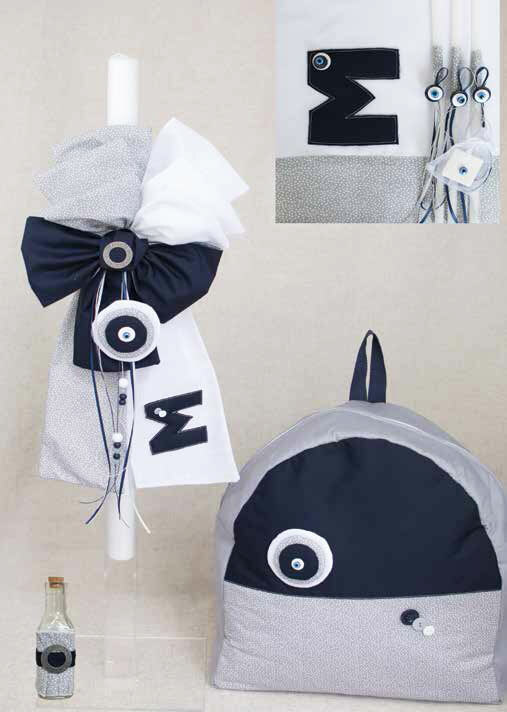 The large fabric back bag in gray-black color is also decorated with a beautiful fabric evil eye. https://www.preciousandpretty.com/2018/07/personalized-baptismal-set-for-boys-e824.html Greek Wedding Favors|Orthodox Crowns|Stefana|Baptism Invitations Personalized baptismal set for boys E824 Baptismal set for boys, with evil eye, and the baby's monogram. Product #: Greek Wedding Favors|Orthodox Crowns|Stefana|Baptism Invitations_2595825582544765151 5 stars out of 5 reviews.